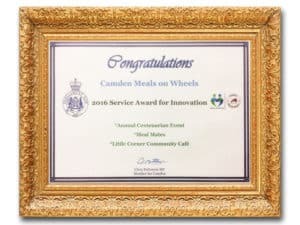 On Monday 15th May, Camden Meals on Wheels held its annual Centenarian Luncheon, celebrating the amazing lives of May Dobbs, 102, Phyliss Stuart, 101, Ruth Cornhill, 99, and Winifred Evans, 99. 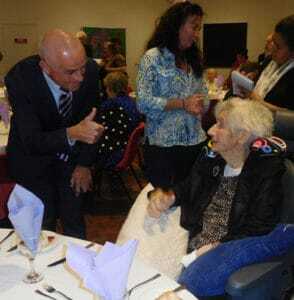 It was also a celebration to acknowledge the 16 centenarians living in the Camden/Macarthur area. The local support of corporate sponsors, schools and dignitaries was especially important to make the event possible. Each of our centenarians has a wonderful life story to tell. 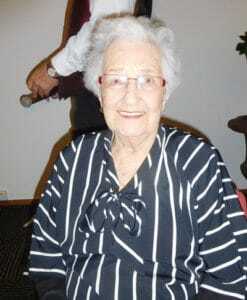 May Dobbs was born on 22nd May 1914 in Wagga Wagga. May is one of six children, she grew up in Junee. May and her brother Bill were very good runners, they won all the races in the district. They were banned from Sunday school Picnic races because they would always win. May and Bill enjoyed to go rabbiting together. May would chase down the rabbits. May worked at the Kings school in Parramatta until she got married in Lithgow. May and her husband owned the Tattersall’s Hotel in Lithgow. They also owned two coal haulage trucks that carted coal out of the open cut mine in Lithgow. May then went to Penrith for several years where she cared for her mother and her aunty. When they passed away she moved to Narrandera where she ran a cafe for her niece. May came to Camden in 1972 and built a granny flat at her daughter Lorraine’s house. May loves to play cards and bingo. May would go out every day to play either cards or bingo. She still enjoys playing bingo. May has travelled overseas and all around Australia. May has one daughter, three grandchildren and three great grandchildren. Was born on Monday 21st June 1915 in Adelaide. She has three surviving siblings – Gwen (99), Elice (96) and young sister Elva (88). She has three children, with her eldest son Alan just turning 80, daughters June and Carolyn and was carer to Michelle (deceased) for 7 years. She has 8 grandchildren, 24 great grandchildren and 6 great, great grandchildren – with family gatherings totalling 57. The family moved to NSW where her dad was offered work. This was the first of many moves for the family due to different circumstances such as when they had to walk away from their farm because it was too wet to produce a crop; another time their shop burnt down; and then her Mum got sick and they went back to Adelaide for a time. Consequently, she had a very interrupted schooling and for a time there was no school to attend until a farmer made a room available and boarded the teacher – until the teacher left. Two months before she turned 14 her Mum told her she didn’t have to go to school anymore because she had found her a job. Most of her jobs were as a live-in Mother’s help – cleaning, cooking, washing up, laundry etc. Between jobs she would go home and help there. 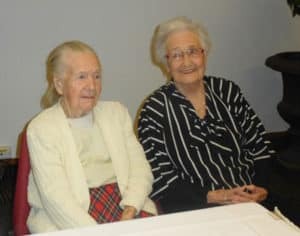 When she became interested in Charles (Chook) Stuart, she was sent to her grandparents in Adelaide, where she worked in her Grandma’s maternity home and loved it. She also used to iron men’s business shirts for ten shillings a week. She married Chook (now deceased) in West Wyalong and they had many moves chasing work in the following years as their children came along. Their last move was in the early 50’s to a property in Werombi which incorporated the Post Office and Phone Exchange. She managed this business, which helped pay the property off, until the Post Office was closed in. Her brush with fame came in 1932 when, at the age of 16, she paid ten shillings to go on a half hour joy flight over Sydney with Sir Charles Kingsford Smith in the “Southern Cross”. She has lived through two World Wars, the Great Depression, four Monarchs of England and 25 prime Ministers of Australia. In her early years there was no electricity; their transport was by horse and sulky; their houses consisted of corrugated iron walls with no lining, no ceilings, no floor coverings, old kerosene tins as furniture and washing day was a full days’ work with the old scrubbing board and boiling the copper. She is fiercely independent and has never held a driver’s licence. She travelled into Camden and home again on the school bus to do her shopping, banking and other chores until about five years ago. Today she still lives on the property at Werombi with the help of family, friends and the wonderful ladies from Carrington Care, and loves to walk through her sprawling gardens, which have been her passion over the years. She can still tell you where the different flowers and shrubs are planted although she can’t see much because of her failing eyesight. 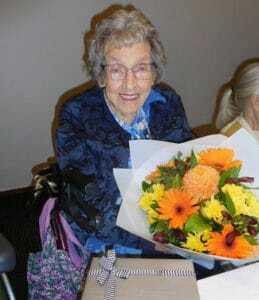 Phyllis, we wish you all the best for the future and a very Happy 102nd Birthday for 21st June. Ruth was born in London on 5th December 1917. When she was 5 her family moved to the country to Brockenhurst in Hampshire. This is where Ruth started school. When Ruth left school she went to work in a big house tending to a married couple that lived there. Her sister was the cook and Ruth was a cleaner. Whilst working there she met a boy named Cliff who worked at the local butchers. Ruth Married Cliff in 1938 and they had three children Richard, Rita and John. Cliff went to war and was away for 3 years travelling to North Africa and Italy. At this time, Ruth was alone with their three children. When Cliff returned from the war he went back to work as a butcher. Ruth worked in a grocery shop and a fruit shop. After Cliff returned to England he found it to be very cold and would say to Ruth he wished they lived in another country where it was warmer. Whilst working in a butcher shopping he met a woman who was a visiting from Australia, she wanted to purchase a leg of lamb for her friends she was staying with as a gift. Cliff explained this was not possible as all meat was still rationed even 5 years after the war. However, Cliff managed to do a special little something for her. This woman who was a direct descendant of John Macarthur was an integral part of Cliff and Ruth’s decision to move the family to Australia. They left England in 1952 at the time Richard was 13, Rita 11 and John 9. It was a month long voyage to Australia. On arrival in Australia the family settled in Camden Park. Ruth managed the boarding house there, cooking three meals a day for 24 people. Ruth did this for 2 years then the family moved to Camden. The children all grew up Richard married first then Rita and sometime later John. Richard and his wife had 2 daughters, Rita had 2 daughters and one son and John had 2 daughters and one son. Giving Ruth a total of 8 grandchildren. She also has 12 great grandchildren and 2 great, great grandchildren. Ruth managed the Henning’s jewellery shop in Westfield Liverpool for 7 years. Ruth retired from this position and her and Cliff bought a caravan and travelled around Australia for 12 months. Richard built his parents a house. They lived there for 46 years. After Cliff passed away Ruth left the family home and moved to a unit in Carrington, she lived there for 8 years before moving to paling court in Carrington July 2016 where she still resides. 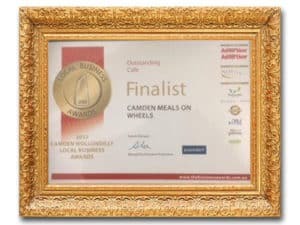 Ruth’s daughter Rita was a volunteer for Camden Meals on Wheels and Ruth was a client until moving to paling court. Ruth said she always loved the meals. Winifred Evans was born on 22nd December 1917 at Forest Lodge Glebe NSW. Winifred was an only child. Winifred’s father worked on the railways this led to the family moving around a lot. Winifred started school in Orange then went to school in North Sydney then back to Orange. Winifred also spent some time with her Aunt in Bathurst where she would also attend school. Her family moved to Sydney and Winifred went to school Forrest lodge then Back to Orange where she finished school. Winifred periodically would stay with her Aunty in Blayney. After leaving school Winifred worked for charters typewriters. During the war Winifred worked for Australian woollen mills examining all the materials that would be used to make uniforms for our soldiers. Winifred married in 1938 when she was twenty one. Winifried and her husband moved to Peakhurst in 1951 into a brand new home where she lived for 60 years. Winifred had one child her son Paul. Winifred said she is very blessed she has her son Paul and beautiful daughter in law Cheryl. Paul and Cheryl had two children Craig and Karen. Karen had two boys Hayden and Liam. Hayden turns 21 in October and is at university studying to be a teacher. Liam is 17 and is still at school. Craig has two daughters Rose 4 and Ruby 2 years old. This gives Winifred two grandchildren and four great grand children. Winifred now lives in Carrington where she has lived for nearly 8 years. Winifred remembers when there was no harbour bridge and you had to catch the ferry from North Sydney into the city. The first escalators in Sydney were in North Sydney and they were very steep and that is how you got down to the wharf to catch the ferry. Winifred says she has had a reasonably happy life and has never smoked and very rarely drank. If she did it was only a very little wine mixed with orange juice or such.